For your media room, it's best to choose a room darkening window treatment. Key considerations are fabric, material type, and color. 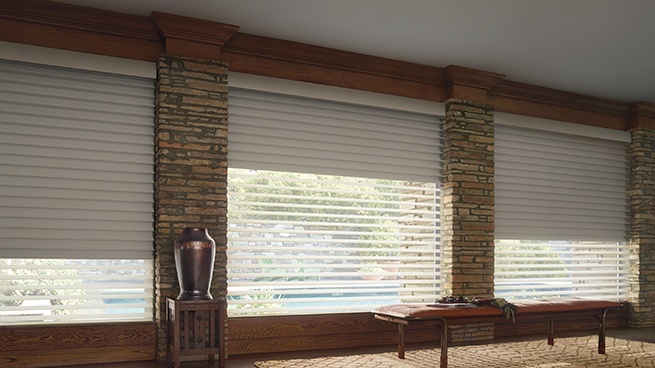 Some of our window treatments are uniquely designed to minimize light gaps. One example is the de-Light™ feature on our Hunter Douglas blinds: The removal of the lift cord rout holes prevents unwanted spots of light from leaking through and allows for tighter slat closure. If you are looking for optional room darkening capabilities, consider a shade with room darkening liner. The liner can be sewn directly to the shade or it can operate independently, offering ultimate flexibility. 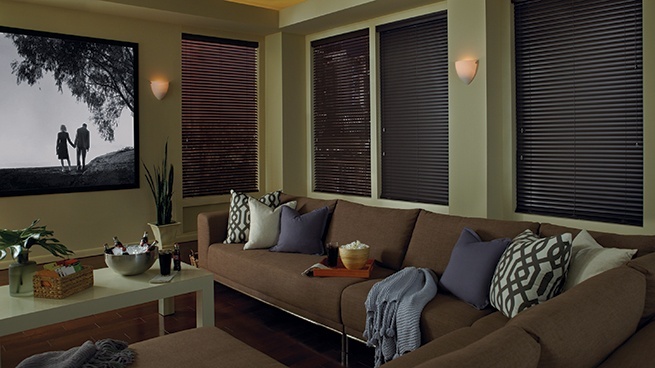 Silhouette® A Deux™ Window Shadings combine a Silhouette™ shading and a room darkening roller shade in a single headrail. This setup provides you with maximum light control: from translucent to light dimming to room darkening. Duette® Honeycomb Shades with Duolite™ have two fabric panels, one made from a light filtering fabric and one from a room darkening fabric. Both panels span the full width of the shade and can be moved independently. A great option for large windows and sliding glass doors are Luminette® Privacy Sheers. This innovative drapery combines a sheer fabric facing with opaque, vertical rotating vanes affixed to the back of the sheer. When the vanes are open, the sheer fabric diffuses and disperses the sun’s rays into soft, natural light. Vanes can be rotated to direct light where you want it, for example, away from the TV. When the vanes are closed, the opaque fabric blocks the light from entering the room.